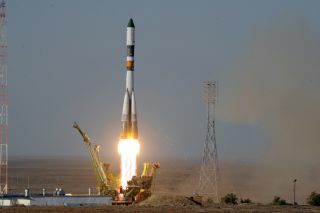 A Russian Soyuz rocket launches the unmanned Progress 44 cargo ship from Baikonur Cosmodrome on Aug. 24, 2011 to deliver fresh supplies to the International Space Station. The rocket and spacecraft crashed in eastern Russian just over five minutes after liftoff. Russian president Dmitry Medvedev has threatened to dole out strict punishments to officials responsible for a string of recent failures in the country's space program, according to news reports. Medvedev threatened disciplinary action, heavy fines or even criminal penalties for the country's recent space woes, which have included a series of rocket crashes and lost spacecraft over the past 11 months, according to the Russian news agency Ria Novosti. "The latest failures [in the space industry] seriously harm Russia's competitiveness," Medvedev said on Nov. 26, according to Ria Novosti. "This means that we need to conduct a serious analysis and punish those responsible." The country's most recent blunder stranded a spacecraft in orbit around Earth, instead of sending it on its intended path toward Mars. The Phobos-Grunt probe was designed to collect samples from the Martian moon Phobos, but shortly after its launch on Nov. 8, the spacecraft's thrusters failed to fire in a maneuver that would have set it on course for the Red Planet. The notoriously tight-lipped Russian Federal Space Agency has remained guarded about the status of Phobos-Grunt, which has fueled speculation that the possibility of saving the spacecraft or the mission is unlikely. If the problem with Phobos-Grunt cannot be resolved, the vehicle will likely fall back to Earth sometime in mid-January, scientists have said. Phobos-Grunt is the 19th spacecraft Russia has launched toward Mars since 1960. None has achieved full mission success. The Russian space program has also suffered four rocket failures within the past year, adding to the troubles. In December 2010, three navigation satellites were lost after a Russian Proton rocket failed before it reached orbit. A military satellite and a communications satellite were also lost in two separate rocket malfunctions. In August, a Soyuz rocket carrying a robotic cargo ship suffered a malfunction minutes after launch in what was a rare mishap for the typically reliable fleet of Soyuz boosters. The rocket and the Progress 44 cargo freighter crashed in Siberia and were destroyed. Investigations into the accident traced the problem to a faulty gas generator in the rocket's third stage, and spaceflight operations were temporarily halted until the issue was resolved. On Oct. 30, a Progress 45 cargo ship was successfully launched to the International Space Station, and a manned launch carrying three new crewmembers for the orbiting complex followed almost two weeks later.